1 of 1 Heat oven to 375 degrees F. Coat bottoms of one jumbo 6-cup muffin pan, or line with muffin cup liners. 1 of 1 In medium-size bowl, combine flour and brown sugar. With two knives, cut in butter until mixture resembles coarse crumbs. Stir in pecans; set aside. 1 of 3 In large bowl, whisk together flour, baking soda, cinnamon, nutmeg and salt. 2 of 3 In medium-size bowl, whisk together bananas, milk, both sugars and butter until blended. Make a well in flour mixture; put in egg. Stir until ingredients are just moistened. 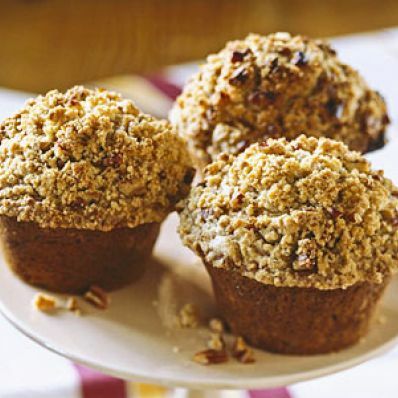 3 of 3 Spoon 2/3 cup batter into each muffin cup; evenly crumble Topping over each. Bake at 375 degrees F for 30 minutes or until toothpick comes out clean. Remove pan to rack to cool for 5 minutes. With metal spatula, release muffins; remove to rack to cool. Makes 6 jumbo muffins. Per Serving: 441 mg sodium, 3 g fiber, 14 g sat. fat, 94 mg chol., 30 g Fat, total, 85 g carb., 8 g pro., 625 kcal cal.